The remains of the Rose playhouse were revealed 20 years ago and aroused great interest throughout the world, far beyond the normal confines of archaeological discovery. To the scholarly world the Rose was famous through the survival of day-to-day accounts written by its owner Phillip Henslowe, and to the theatre world as the stage where many of Marlowe’s plays were first performed; the investigations brought this history to life. 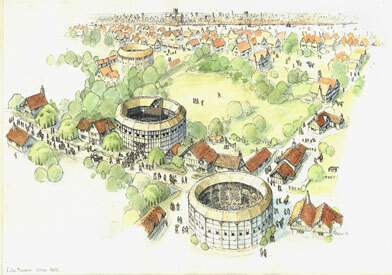 The excavation of a smaller part of the Globe, the home of many of Shakespeare’s plays, revealed less detail but was an important emotional, as well as archaeological discovery. This volume is an archaeological report, but it will appeal to a wider audience of those interested in the history and development of the theatre. The hundreds of individual elements found in the excavations, together with newly researched documentary sources, have been fully integrated into a narrative description and thematic discussions on every aspect of the playhouses, the plays and the audiences. The volume is lavishly illustrated with contemporary views, reconstructions and detailed drawings and photographs of structures and finds from the excavations.